I received so many reports of what was done in libraries during the Fun Palaces weekend that I didn’t want to truncate people's stories, so they have spilled over into a second post. "Our deputy head of service set me a challenge. Fun Palaces. The challenge was the fun palace weekend was next month! So quick march! What to do? I know, I’ll become a maker. supporting us, volunteering, sharing a skill, let me know. We had many an offer/idea. Elsie came and created book art and showed others how to. We had PING PONG. Dobble, the most competitive card game ever! Curly tales Theatre Company performed Jackie and the Beanstalk. Pom pom making. Archery. Stop motion Lego. Drumming lessons by the very talented Maisie. Giant games. And lots more! Everyone had a fantastic two days. Some folk enjoyed day one so much they came back for day two. Elsie (book art artist) said: “I was amazed at how many people were interested in my book folding .....especially the 2 teenage boys who seemed to really enjoy themselves and talked to me constantly about their interests and hobbies. One even took some paperbacks away with him so he could try making other things, he fancied designing a pumpkin! There was a good mix of participants....adults, parents with children and teens. I’d be happy to come to any similar events you have in the future” and “best day EVER!” said Daniel after beating an almost 50 year old at table tennis!!!" So look out Leeds, next year will be bigger and better. On Saturday 1 October Vivacity Peterborough’s Central Library was absolutely brimming with activity – all fun, for all ages, and all free! 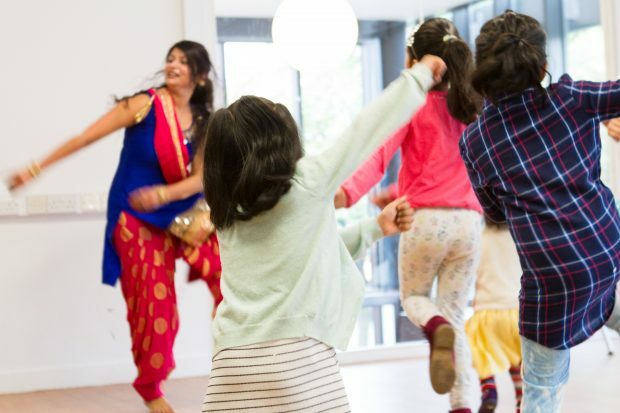 Produced by Peterborough Presents, the city’s Creative People and Places programme, Fun Palaces featured a jam-packed day of workshops and performances that the whole family could enjoy. Across the day we saw 754 visitors, which is more than double the library’s usual visitors on a Saturday, and most families stayed from opening until close. Activities included postcard making, henna painting, decoupage and embroidery, origami boat making, animation and zoetrope discovery, paper marbling, painting mini canvases, mosaic making, and digital painting using the Google Tilt Brush. Performances were held upstairs in the John Clare Theatre, and included storytelling, sing-a-longs, ukulele playing, folk dancing and interactive projections. 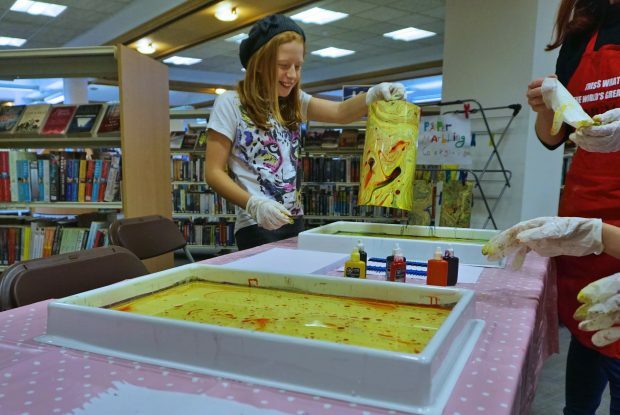 Over “Fun Palace Weekend” (1 and 2 October) we had six Fun Palaces in Essex Libraries - Saffron Walden, Walton, Manningtree, Chelmsford, Great Baddow and Witham Libraries all took part! It was a great way of engaging with customers who were very happy to come in and share their skills and our libraries were buzzing. 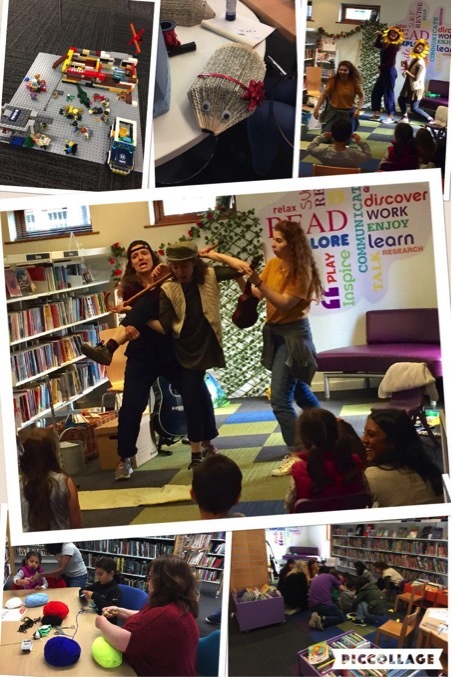 We had physical activities and singing in Chelmsford Library and Ozobots challenge at Great Baddow Library (who also had a cardboard box challenge). Saffron Walden had a range of activities in and out of the library working with partners. Witham library really went to town – they created a Snow Queen themed day complete with actual Snow Queen and then organised art and science activities linked to each of the four seasons with local craft groups, the local school and various other local organisations all helping out. It was a really good weekend and one we definitely want to build on next year. We loved it because it appealed across all age ranges and it was so good to see families and generations learning and having fun together. Paula Carley sent me a full report of what they did in Manchester, where 8 of their libraries were turned into Fun Palaces. “Our team of three Service Development Coordinators, (myself included) were responsible for developing them in North, South and Central Libraries. Personally one of the things that I found really lovely about the Fun Palaces was that they very much respond to the communities that they are situated in. This allowed for a wonderfully eclectic feel. Activity leaders both individuals and partner organisations really enjoyed the Fun Palace. 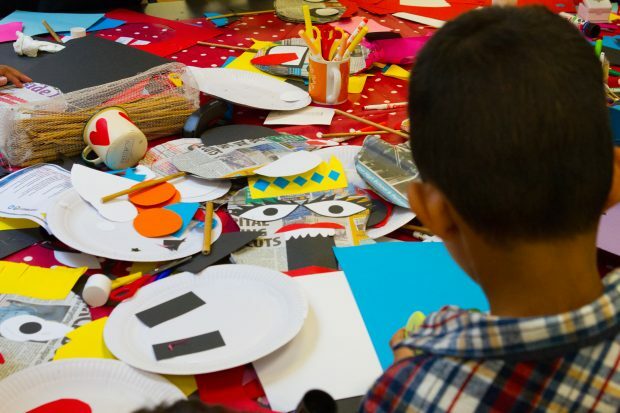 Miriam a well-established community arts worker (Manchester Literature Festival) who ran a funny face making workshop in Longsight Library Fun Palace commented that it had been the busiest workshop she had ever delivered and had to call a friend to come and support her! It was a particularly busy Fun Palace with an estimated 2000 visitors throughout the day! Another activity leader Carole, who responded to a call out for folk to get involved, had never done anything like this before. She ran a pen and ink drawing workshop. When she turned up in the morning, she was really, really nervous. By the end of the day, she was absolutely buzzing with the experience. It was really fantastic to see her level of confidence by the end of the day! We had excellent feedback from people who came and participated in the Fun Palaces. Some families just settled themselves in for the day. People just got really stuck in and enjoyed making and doing. There has already been comments of "when’s the next one?" I feel that after this first year of Fun Palaces, we’re definitely on board for follow up years. I think all of us in libraries got to see the benefits of being involved. In building and strengthening relationships with new and existing partners, local communities and individuals. We all recognised how important it is for us to have time that is dedicated to fun and learning with our communities and to come together and just enjoy. Hopefully we will have learnt a few things on the way also to make it less labour intensive for future involvement. We will be able to build upon links and relationships already built and be scouting throughout the year for next year’s cohort of activity leaders. We will have developed a timeline of what needs to done at which particular point!! Also pacing, it all got a bit frantic the nearer to the Fun Palace that we got. I think (hope) that we’ll have a better paced lead up to next year's!! There was a lot of work involved in getting the Fun Palaces up and running, but absolutely worth every 3am awaking with the “but what if nobody turns up!” voice!!" The team in Staffordshire heard Stella Duffy talk about Fun Palaces, and asked some of our colleagues in neighbouring counties about their experiences. What we learned inspired our team of Stock, Services and Activities Officers to try a Fun Palace. Each officer selected one library in their cluster and as planning time was short, they contacted local groups to see if they would like to run a Fun Palace at the library. In future, the officers will advertise well in advance for people and groups interested in participating. At Perton Library, the Wild About Perton group (who have created a garden for the library and who run many library activities) ran Wild About Perton Library Fun Palace with activities such as making fat balls for birds; using the birdcam; a library bug hunt and pond dipping. At Penkridge Library, community members ran J.R. Tolkien Fun Palace with craft activities; readings by Tolkien Society Member Maggie Bailey; drawing by artist Hannah Reynolds. Our Reading Hacker Mickey (one of our young volunteers) hosted the day and helped the volunteers running the sessions. Burton Library had a silk painting taster session and Reading Hacker Emily (one of our young volunteers) ran henna hand decorating sessions. All of our 12 libraries in Oldham were transformed into Fun Palaces for the day on 1 October. We had over 30 different activities taking place across the service led by local makers and crafters. (Full range of activities listed here). There were also self-led activities in every library, such as craft activities for adults and children (for example, pin weaving and wool wrapped letter decorations), games, LEGO Quest and adult and children’s colouring. The programme also included a library sleep over at Oldham library where local girl guides took part in a forensics activity as part of their science badge, watched a film, ate pizza and listened to stories before lights out at 1.00am! It was a brilliant and inspired weekend, led by one of our very talented library workers, Kate Smyth. Exeter Library hosted its first Fun Palace this year. Footfall increased by 20% on both days (compared to the same weekend in 2015). Comments from participants included: "Laughter Yoga was brilliant", "Met Office - fantastic devices to explain weather - science/events. Really, really interesting" and "Board games - great fun especially as it was in different language". They also tweeted a video of the dinosaur running through Exeter library. Anyone for Fun Palaces 2017? I hope this pair of blog posts illustrate the range of activities that went on during that weekend in early October, and show how the difficulties of attracting new visitors and running an open day in a building that is already open can be addressed by working with your local community to explore the wide variety of things people are interested in. I noted how often examples were about crossing intergenerational barriers, welcoming large numbers of boys into the library, and the overall sense of fun. I don't know how many books were borrowed, but if those people who attended for the first time become regular visitors, I'd mark the event a success. Please note, the content of this piece was provided by a range of individuals. Views expressed here do not necessarily represent the views of Libraries Taskforce or the DCMS.